Travelling up to Glasgow I was reminded how airports are using a range of technologies to track and cater for passengers as they travel by air. We know big airports are using technologies such as wayfinding to help travellers quickly access the right gate when boarding their plane for example. These technologies are easily transferable to the education setting, but we do need to consider not only if we can do this, but should we, how does this enhance the student experience and what are the benefits to the institution? 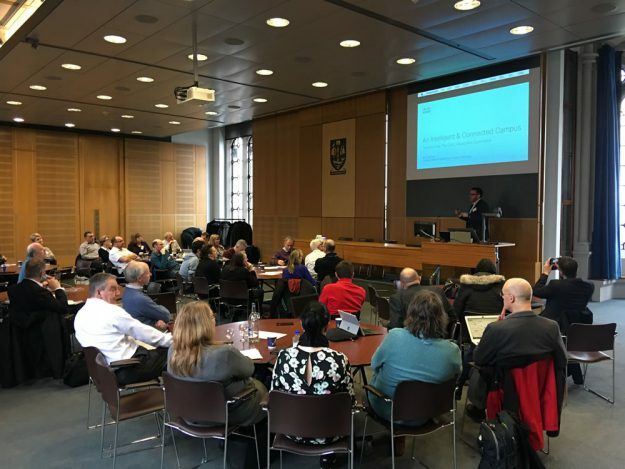 Glasgow was the setting for our second Intelligent Campus Community Event for our growing community of practice. The community of practice gives people an opportunity to network, share practice, hear what various institutions are doing and what Jisc is doing in this space. We had delegates from across Scottish HE and FE, in addition to numerous English and Northern Irish colleagues from as far away as Kent, Weston-super-Mare and Belfast. Since our last community event not a huge amount has happened in the two or so weeks since then, and it was a very different audience, so I repeated the session I did in Sheffield on the project and where we were. As well as covering some of the background to the Intelligent Campus space, the presentation also shows what Jisc is doing in this space, how we are doing it, and why we are doing it. The Intelligent Campus space is quite vast and wide, the Jisc project though looking at the large space is quite focused on extending our analytics services into the physical world. At the core of the learning analytics service is the learning data hub (formerly called the learning records warehouse) where academic and engagement data is collected, stored and processed. We’ll extend the learning data hub to enable data to be gathered in from physical places (movement trackers, heat and CO2 sensors, for example) and from systems that record and monitor space and equipment usage, timetabling and other activities. By analysing when and how rooms are used organisations will be able to make smarter, more effective use of learning spaces and other facilities across campus and to improve curriculum design and delivery. 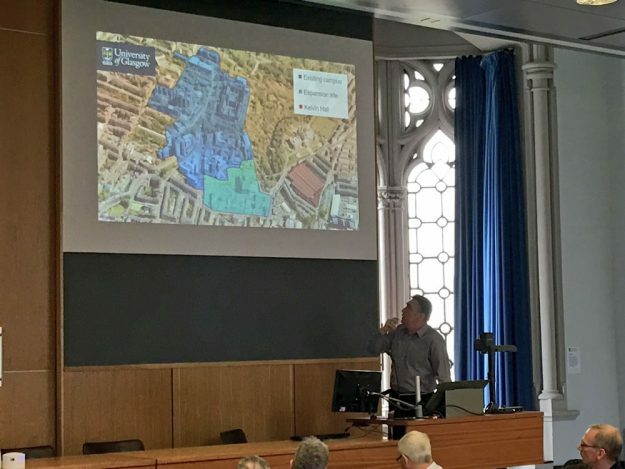 After my introduction and overview of the project, we had Michael Burns from the University of Glasgow talk about the background and history of their Smart City initiative as part of their new £800m campus extension. After lunch we had na activity looking at use cases in the intelligent campus space. Then Professor Matthew Chalmers from the School of Computing Science at the University of Glasgow gave a presentation on his work on Bluetooth beacons and sensors acorns the Glasgow campus and the impact it had on the student experience. Following Matthew, Ben Fairburn from Cisco talked about their experiences in creating an intelligent campus at Cisco. This has a lot implications for HE and FE institutions where 50% of staff are in management, professional, service and administrative roles. 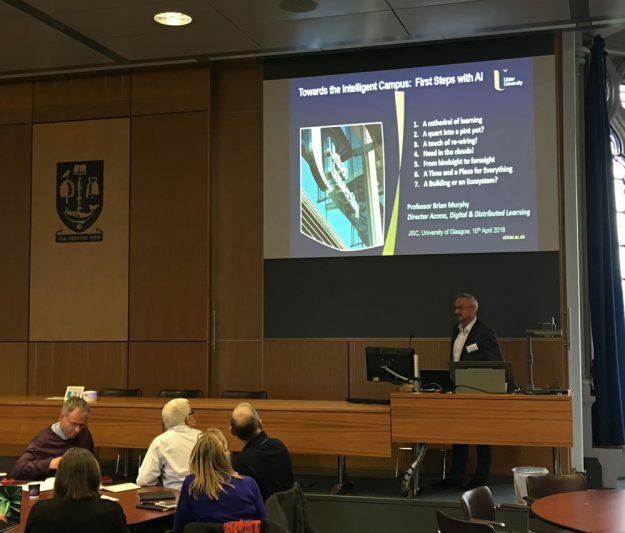 At the end of the day Professor Brian Murphy from Ulster University talked about their plans of using AI within their new campus. The third of these events is being hosted and taking place at Plymouth Marjon University on the 21st June 2018 from 10:00 to 4:00, and lunch will be provided. 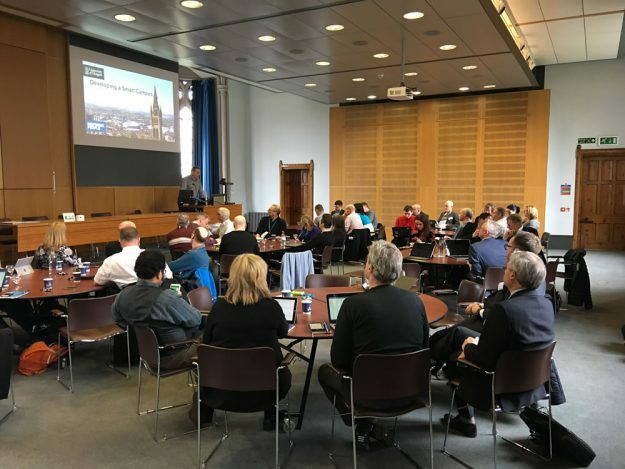 Posted by James Clay on April 14, 2018 in community event, intelligent campus and tagged glasgow, smart city, university of glasgow.